ATLANTA, July 15, 2016 – Seventeen-time Grand Slam Singles and Doubles Champion and U.S. Davis Cup Team player/captain, John McEnroe, will return to Atlanta to participate in the 2016 BB&T Atlanta Open’s Celebration of the 20th Anniversary of the 1996 Atlanta Olympic Games. 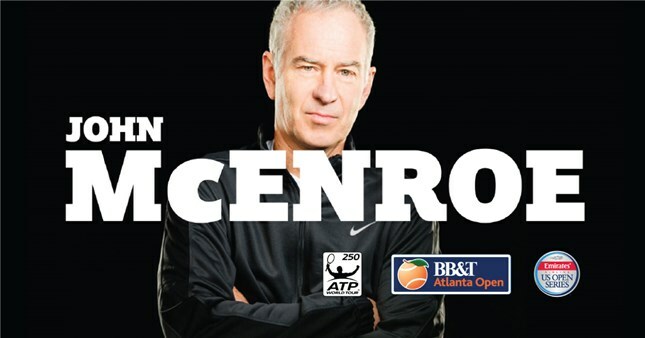 McEnroe replaces an injured Andre Agassi to play on Sunday, July 31, at Atlantic Station at 7:30 PM. McEnroe’s addition to the star-studded line-up of Olympic medalists scheduled to attend the BB&T Atlanta Open, part of the Emirates Airline U.S. Open Series, reinforces the anticipation and excitement for a week of appearances by past and current champions, including Harrison ( Judo Gold Medal), Kerrigan (Figure Skating Silver and Bronze), Fernandez (Tennis Gold), Steffes (Beach Volleyball Gold), Bennett (Swimming Gold) and Devers (Track and Field Gold). All are scheduled to be featured at the 1996 Atlanta Olympic Games 20th Anniversary Exhibit presented by Coca-Cola. The exhibit is free and open to the public and coincides with the BB&T Atlanta Open's celebration of the 1996 Atlanta Olympic Games, which runs July 30 – August 7. Agassi, who won the Gold Medal at the 1996 Atlanta Summer Olympics informed tournament officials this week that he made a major decision to withdraw from tennis events for the foreseeable future due to recurring back problems. "In order to avoid further injury, I have decided there is a need to step back and take a break from competitive tennis," stated Agassi. "It’s been a great run and I will always cherish the memories of playing in Atlanta and at the 1996 Olympic Games. I know John will put on a great show for the fans in my absence." The 1996 Atlanta Olympic Games 20th Anniversary Exhibit presented by Coca-Cola will be open 11 a.m. - 6 p.m. each day and is located next to the Atlantic Station Publix. Appearances will be Harrison (July 30,31), Kerrigan (Aug 1), Fernandez (Aug 2), Steffes (Aug 3), Bennett (Aug 4) and Devers (Aug 5). Tickets on sale now at www.bbtatlantaopen.com or by calling the ticket hotlines at 855 307-1981 or 404-941-9202.